The Soul Corner - Dennis Coffey "Scorpio"
The first Rodriguez album Cold Fact was produced by Detroit guitarist Dennis Coffey. And had I been one of the amateur investigators tracking Rodriguez for decades, that mention in the liner notes would have been my first clue that Rodriguez was from Detroit. Dennis Coffey is a brilliant guitar player known for his prototype funk sound, with wah wah pedals, distortion, etc. You've heard him on "Psychedelic Shack", "Cloud Nine", "Band of Gold," "War", and many Motown soul-rock classics. Coffey was, among many other distinctions, the first white musician to appear on Soul Train. Happy College Football Season Everyone! is gonna get play on a site where all the contributors are domers. Brick Mower is releasing their second full-length, My Hateable Face, on Don Giovanni Records, on 2 October. They're also putting together a tour in October. You can see the dates and places on their page at Blogspot. And check out their Bandcamp page, where you'll also find their other stuff, including an EP for free download. And I hope wherever you are this Saturday morning at 9 am Eastern Time, 6 am Pacific Time, or 2 pm Dublin Time, you'll hoist your pint of Guinness toward the sky and yell, "Go Irish, beat those ACL-hating Midshipmen!" When you hear some cities mentioned in connection with a band, your first assumption may be that there will be a bit of a country influence. Nashville, Tennessee is such a place. And Bakersfield, California, of course. And certainly Dunfermline, Scotland ... wait ... what? Yes, Middleton Hall of Dunfermline has made available for free download "First Bus Out of Town", a sparkling, country-tinged guitar pop song about the occasional need to be the first to break off a relationship. The band was begun in a couple of years ago, but the current line up wasn't in place until this year. The members of the band are Steve Haddow (guitar and vocals), Simon Ellen (guitar and vocals), Dougie Shanley (bass and vocals), and Gordon Helm (drums). New Discovery - Rodriguez; and film "Searching for Sugar Man"
I am hesitant to write too much about the extraordinary story of the Detroit singer-songwriter known as Rodriguez. Far better that you simply see the documentary film Searching for Sugar Man, as this truth-is-stranger-than-fiction tale is far better told in 90 minutes by the parties involved than anything I could write here. But I will say that I grew up in Detroit in the 1970's when Sixto Rodriguez recorded his music, and while my ear was to the ground, I did not ever hear of him at all until I read a review of Searching for Sugar Man just a week ago. And yet halfway around the world, his songs literally helped spark a revolution and became the soundtrack for an entire nation. Which would not be totally shocking perhaps except that Rodriguez had no idea for more than 25 years that anyone anywhere in the world outside of little more than friends and family had heard his music. It could have only happened pre-internet, and perhaps only in a country as cut off from the world as apartheid-era South Africa. I will also include a movie trailer, though it contains way too many spoilers. I include it for those of you non-trusting souls who need more. Seriously, if this film is showing in your town, skip the trailer and go see it. Now. Or get it from Netflix. It is an amazing film about an intriguing, fascinating man and great songwriter. Rogriguez is touring the US now at age 70 for the first time in his life. I confess to being a fan of Beat Connection, but I actually have a complaint about this album, which is this: If you are going to release an album of high quality summer electro-pop, such as The Palace Garden, why not release it at the start of the summer? The answer may be that Beat Connection resides here in Seattle, and we didn't get true summer weather until quite recently. But I imagine that other regions actually got summer more or less as predicted by the calendar, and those folks have been deprived. However, we can't hold a grudge, because regardless of its timing, this is a welcome vacation-time treat. With danceable beats, chiming synths and a palpable Caribbean feel, the music manages to be chill and feel-good. Some tunes may be more appropriate for the poolside, and some for the club floor, but it all works. Particularly evident, is the band's feel for melody, which allows The Palace Garden to transcend the fairly large volume of synthesizer music generated in today's marketplace. It is an album that you will want to take along on your end of summer adventures. Rave on! Beat Connection was formed by Jordan Koplowitz and Reed Juenger, who gained some well earned press and devoted fans with their EP Silver Screen. For The Palace Garden the group includes Tom Eddy on vocals and Jarred. The album is released by Tender Age. What were you and your best mates doing in your late teens? I'm certain we could come up with a long list, some of which might even be of interest. However, unless you are more precocious than I was, I think it likely we'll score this round for Cheltengham, UK's Young Kato. The six-piece band, with an average age of 18, is signed to Manchester's LAB Records. Their debut EP was released on August 26, and their smashing single from the EP, "Drink, Dance, Play", was released in late May. "Drink, Dance, Play" opens the EP, and showcases the band's unabashed intent to play guitar/synth pop anthems with upfront hooks and soaring vocals. A warm, infectious call to live for the moment, it is a great summer song. But while "Drink, Dance, Play" may be the focal point of the Young Kato EP, the other three tracks demonstrate that this band promises to have staying power. "Break Out" is a similarly paced album that deftly follows the loud/soft template. "Life's Good" is an interesting song with somewhat less fireworks, but a nice melody, full sound and excellent vocals. The final track, "Revolution" is a burning post-punk track that ends the album as it started -- with evidence that this is a band from which we can expect to continue to hear great tunes. Young Kato is Tommy Wright, Jack Edwards, Joe Green, Joe Lever, Harry Steele and Sam Henderson. 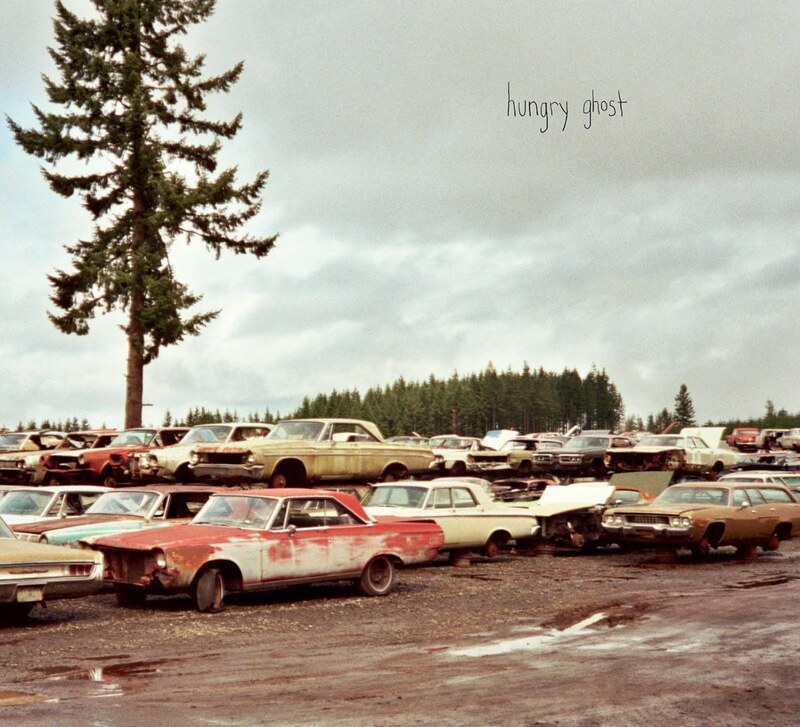 Hungry Ghost's pedigree is impeccable, and given the variety of backgrounds of its members, it's no surprise that their self-titled debut is sprawling, messy and awesome. The band consists of Sara Lund (Unwound, Corin Tucker Band) on drums, Andrew Price (Irving Klaw Trio) on guitar, and the Lorca Wood attack (The Drags) on bass. Sam Coomes of Quasi produced and also plays some keyboards on the record. They describe themselves as a supergroup of "obscure 90's indie rockers". The sound is strongly punk-influenced heavy rock - heavy drumming and bass anchor some spectacular flights of guitar shredding. They sort of play on the Kinks' "Powerman" to start off the record, and it's reimagined in a way that is both familiar and unique: "Am I a Powerman/or just a regular man? ", then a whole bunch of guitar playing, and "This is my comeuppance/you knew it had to come". 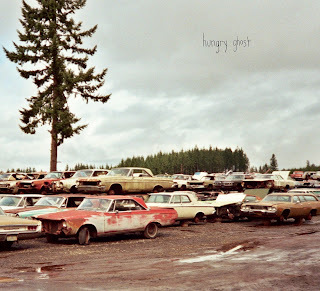 You may hear echoes of Heatmiser, Sonic Youth and Eleventh Dream Day - I certainly do. And they veer off into jazz and funk territory, featuring some interesting tempos and little touches like the falsetto vocals at the beginning of "Shame" and the almost chicken-scratch guitar throughout that song. But even there, the heavy bottom keeps things anchored. On "Alice", things slow down a bit and the band stretches out with some keyboards serving to anchor occasional guitar flights and variety in the bass and drum attack. But things pick up again on "Wicked Betsy", a punk song in which Price yelps over a guitar attack and the whole thing's done in a little over three minutes. What could be more punk than that? The final cut, "Know" is terrific - it stretches out in a way that reminds me of "Voodoo Child". Or you can buy a physical copy, click here.